I could use this Premium Bluetooth Headphones ONLY $48.99 Shipped (Retail $319.99). 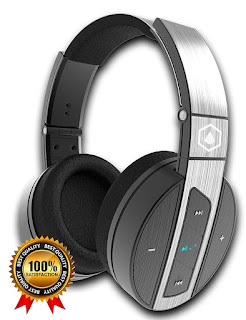 ♪THE WORLD’S #1 BEST VALUE PREMIUM OVER-EAR BLUETOOTH HEADPHONES – Simply amazing, hi-fidelity, crystal clear sound, and deep, rich, accurate bass —— ADVANCED ♪NOISE ISOLATING TECHNOLOGY and distortion free audio, even at its highest volume level. ♪SUPERIOR CUSHIONED COMFORT & ULTRA PORTABLE – The HIFI ELITE Super 66 features a lightweight, ergonomic design for long lasting comfort and easy portability —— ♪INTEGRATED HANDS FREE MICROPHONE – for crystal clear wireless calling from Smartphones and iPhones. ♪FAST & EASY WIRELESS BLUETOOTH PAIRING – easily pair with Smartphones, Tablets, Laptops, Macs, iPhones, iPads, iPods, Android Smartphones, Windows computers and TVs. —— ♪BLUETOOTH OR WIRED CONNECTION – with up to 8-12 hours of playtime via Bluetooth connection. When the HIFI ELITE runs out of juice you can continue listening via wired connection with your included AUX cable. ♪LEADING NATIONAL COLUMNIST AGREE – “Compared to $300 Beats headphones, the Super 66 sounds better. This may surprise the general public, but not audiophiles…The HIFI ELITE’s are Hi-Fidelity Headphones that will knock your socks off with incredible audio”- Don Lindich, SoundAdvice. ♪CNET AGREES – “These noise-isolating over-the-ear phones look and sound like they cost a lot more…the Super 66s look and feel substantial, with a brushed-metal band that folds for easier storage and heavily cushioned ear cups…definitely among the more comfortable I’ve ever worn… the headphones sound superb” – CNET: Rick Broida.